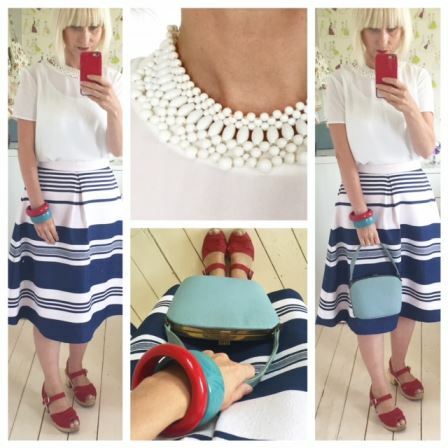 Yesterday I embraced my inner sailor with this nautical look! I love a breton stripe and have many striped tops, which look great worn with jeans. My favourite shape in vintage and modern clothing is a wide, structured skirt, which is both elegant and flattering. I have many of these skirts and recently bought two more in the Oasis sale. They are design classics and I reckon I will wear them for years to come. This striped one looks great teamed with a simple white T, with vintage accessories added. I am using a pale blue 1940s bag which was bought from Peterborough Antiques Fair and given to me for Mother’s Day and a white beaded necklace, which is also vintage. 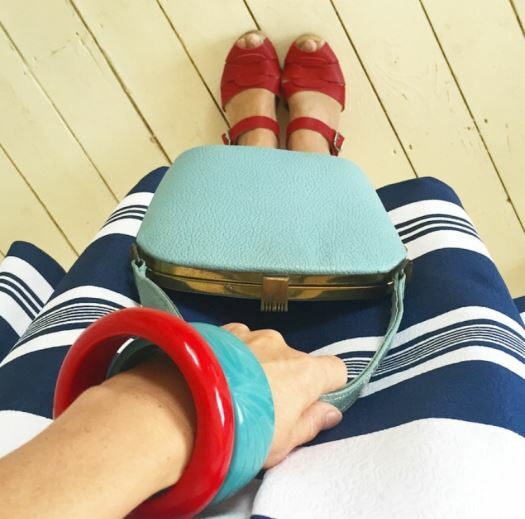 The skirt looks great with my red Lotta from Stockholm clogs, but any red shoes would work. I am a big fan of Oasis as their clothes have a vintage feel to them. They always look great paired with vintage too. 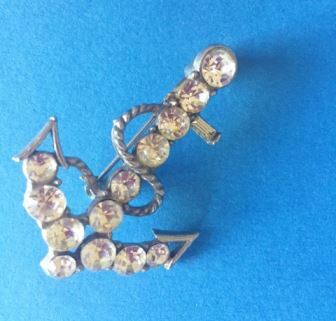 Next time I will also wear my new vintage brooch bought last weekend at a car boot sale…a rhinestone anchor! Perfect!